When – if ever – should details of the sexual activity of a sexual assault complainant be admitted in a trial? Should it make a difference whether the sexual behaviour was with the defendant, or a third person? Is this evidence ever relevant? Is the law on this issue too complicated, outdated and/or in need of reform? These are highly complex and controversial questions. And, despite laws introduced to reduce the use of sexual history evidence, we know that it is still commonly used in sexual assault trials (see Kelly et al 2006 report). Many victims have shared how this evidence is often used to humiliate them & disparage and discredit them in the eyes of the jury. 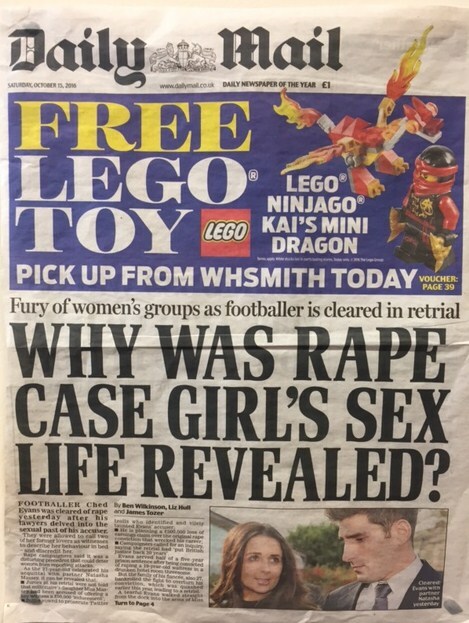 These questions have recently become the focus of heated debate in the UK following the acquittal of footballer Ched Evans after sexual history evidence with another man, not Evans, was allowed. This case shows that the law needs reform. Clare’s research: Re-writing the law on sexual history evidence In the major case in this area – known as R v A – the then House of Lords (now known as the Supreme Court) revised the law in this area to allow sexual history evidence to be admitted in more circumstances than had been set out in the statutory provisions, namely sec 41 of the Youth Justice and Criminal Evidence Act 1999. I have rewritten this judgment from a feminist perspective – as part of the Feminist Judgments Project – demonstrating that the law could and should have been interpreted differently. An excerpt of this judgment was published in The Guardian and the full version is in the book Feminist Judgments: from theory to practice that I co-edited with Erika Rackley and Rosemary Hunter.